The Gerbera is a very popular choice for flower arrangements and bouquets, as it’s a popular gift flower that possesses many positive meanings – from joy and happiness to innocence and purity. This crochet pattern includes pattern diagrams, instructions in American Standard Terms (written in English), and step-by-step guides with photos (300dpi) for this crochet Gerbera. 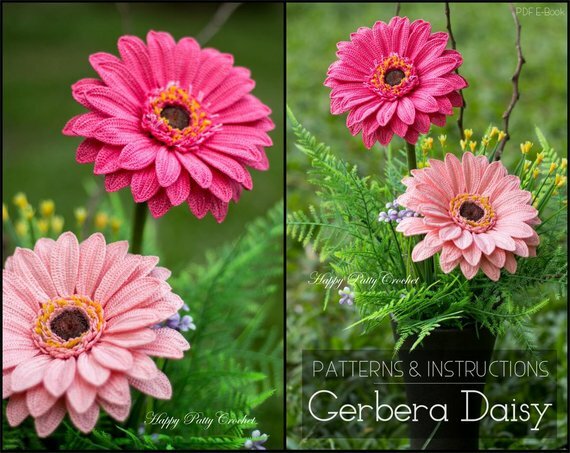 In this pattern, you’ll find a crochet flower pattern, including diagrams and instructions, that will show you how to crochet this beautifully realistic crochet Gerbera.